The line pulls through seven sizes starting from 550 lbs (250 kg) through to 11,000 lbs (5,000kg) for your specific application. The removable handle is designed to prevent tampering if the operator should leave the winch under load. For ease in lifting heavy loads, our higher capacity GW wall mounted winches are equipped with two speed gearing. 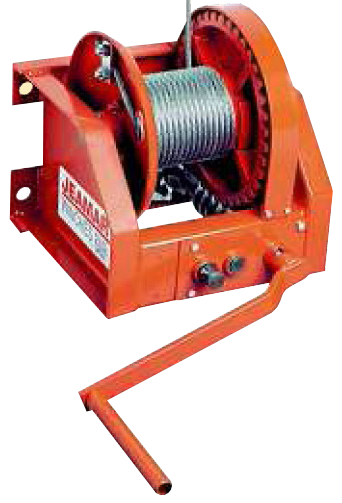 This manual winch is designed, and manufactured with effective use of the needle roller bearings and brushes to minimize friction. This ensures a minimum cranking effort, smooth running and an increase in winch lift capacity.